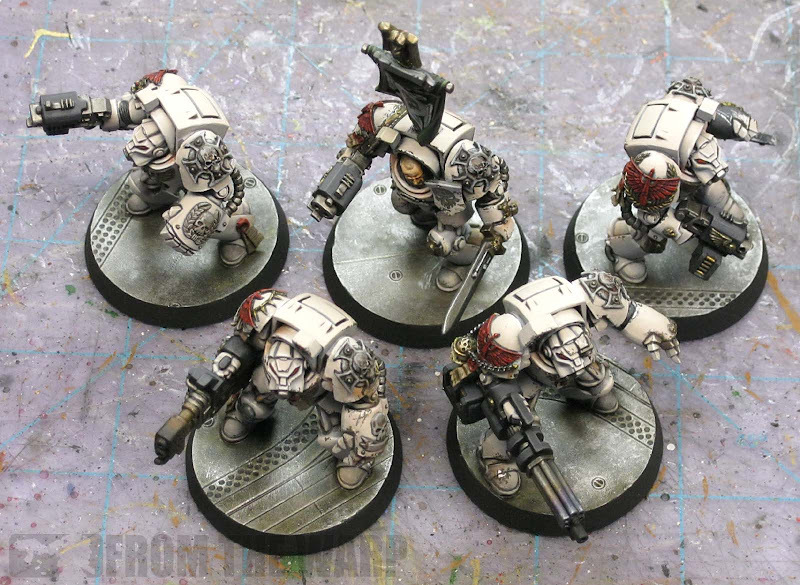 And here is the completed Deathwing squad. I've been forcing all the smaller tutorials on you guys for the past week so I won't make you go through any more than the "how to" paint them that I'll post in the next couple days. I like to think these guys are my best work to date. I mean I have lots of projects that are my favorite for one reason or another, but these guys are the bringing together of so many different aspects for me into one complete unit. The shoulderpads are Forge World and the bases are Secret Weapon Miniatures. If you've got any questions on any of the models, just ask and I'll do my best to answer. Enjoy. I like what you've done with the chipped paintwork in select locations. Is this achieved with a sponge dab, or more select flicks of a paintbrush? Definitely the best I've seen you do yet, Ron. The face on that sergeant is amazing. Great touches with the weathering on the armor as well. I'm very curious on how you achieved the 'warm' look of the sergeants face..! This almost makes me want to go with the bone colour scheme for my Deathwing! 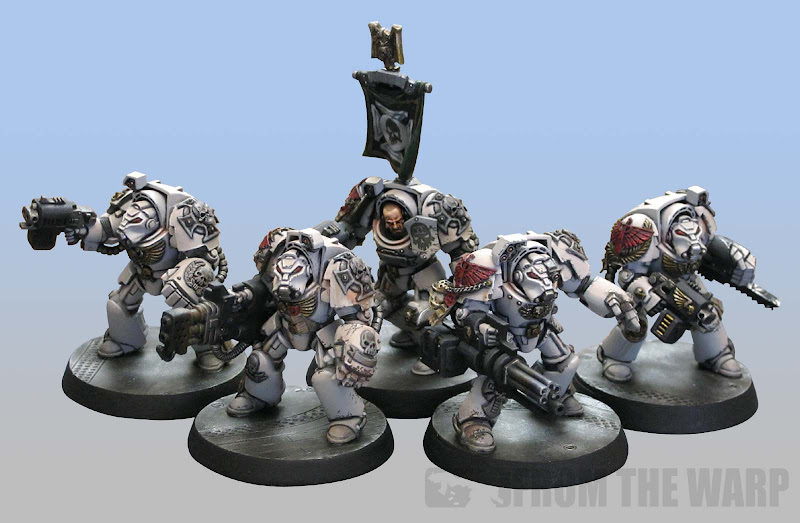 These are some of the nicest Deathwing terminators I have ever seen. Ever. Congratulations on some epic painting Ron! I think some of your most impressive work yet! Ron amazing job as always, but would you mind stopping it? Seriously every time I stop by here I start thinking about playing loyalists against my better judgment. You could at least do a traitor guard or a xeno army. Seriously, well done man very nice models. I'm usually not a fan of battle damage, but this just looks too natural and perfect to dislike. It's incredible. That Sergeant's face is possibly the best face I've seen painted in a long time. Nice work. Inspires me to get my DW started / finished. Awesome effects you've achieved on the sarge. Spectacular work, Ron! All the various techniques have come together to make a unit that is simply beautiful. 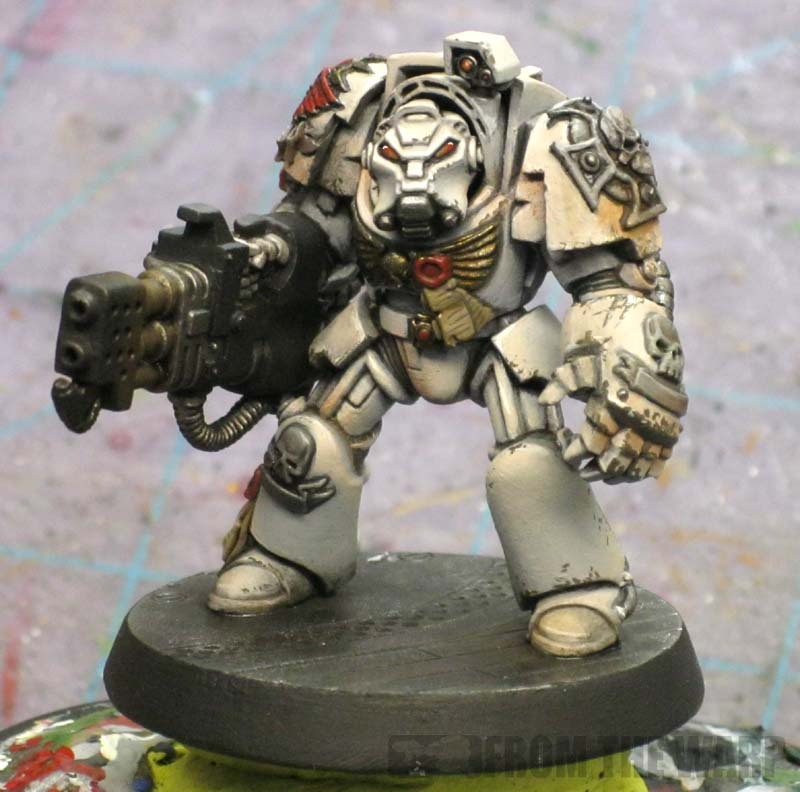 The restrained battle damage looks great, definitely a case of 'less is more'. Can't wait to see what's next! Awesome work Ron! how far along are you with the rest of the army? One point I have to make though is the second terminator down doesnt apear to have any of the battle damage that the others have, have you missed that one out? jabberjabber: It's done with the tip of a paintbrush, but since I'm heavy handed in my application, I often have to go back and remove/clean up about half of it. Dannis: It's a matter of using warm, saturated colors like Dwarf Flesh. That was the base for the face along with a wash of GW Ogryn Flesh and Devlan mud in the deepest recesses. The highlight is Elf Flesh if I remember correctly. Old Shatter Hands: I'd like to think these guys would have a chance if entered or at least make first cut in the squad category. Snake88: Hudson is right, he's the "new" guy sporting the newest suit of armour that is least battle damaged. It's one of the Easter eggs hidden in the squad. Awesome stuff, Ron. 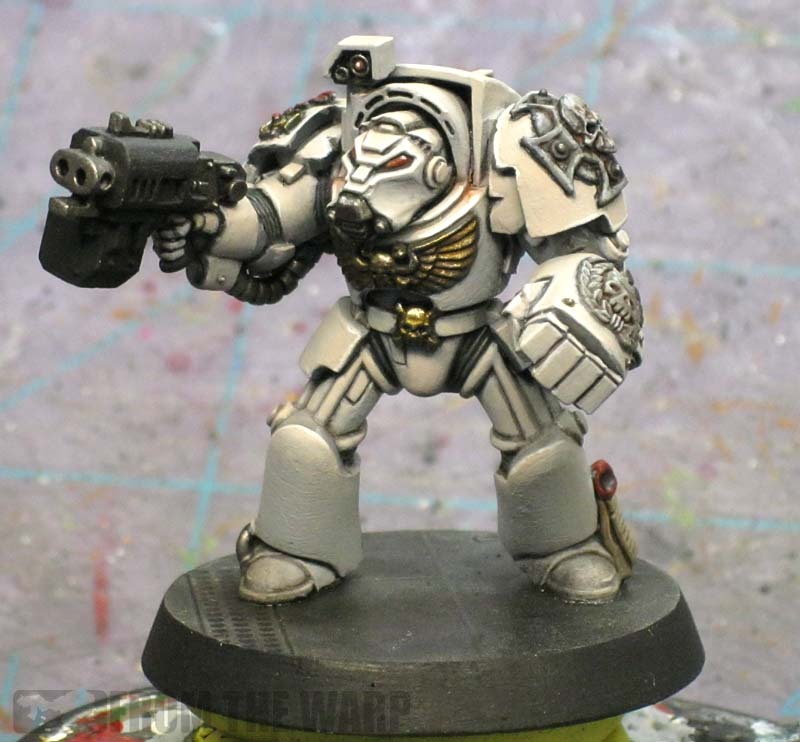 Makes me wanna redo my entire Deathwing :) Nice to see a much paler version of the DW color scheme! It's just off-white, right? You have every right to be proud of these guys, Ron; they look fantastic! 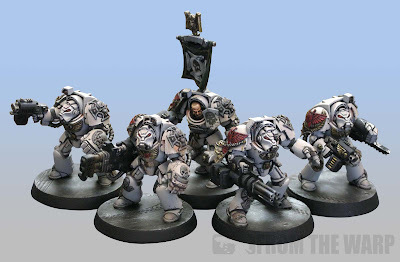 You just made the best argument I've ever seen for selling-off one's whole painted army, and starting over every few years. The leap in skill is noticeable, and this blending of new techniques creates a look that's natural, believable and seamless. Well done, sir. Now do a land raider. One of, if not THE best Deathwing squads I've seen. Your choice of using a less cluttered base was spot on and really lets the figures stand out. Hey I got it right! Also notice that the Heavy Flamer dude is a bit 'sootier' than everyone else -- nice. 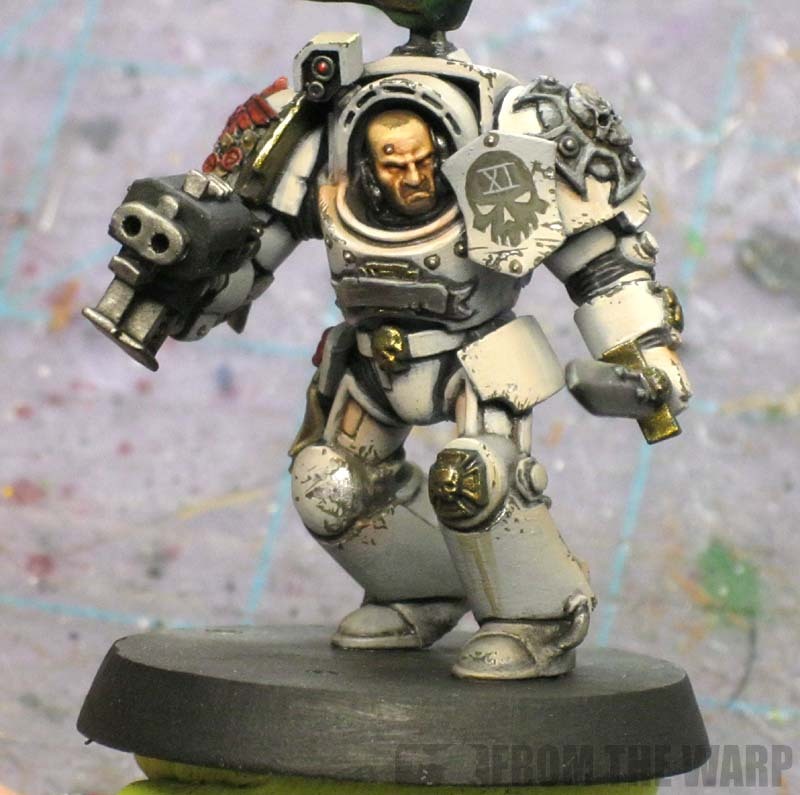 They are superb Ron, easily some of the finest Deathwing I've ever seen. If GW were ever looking for miniature photos for a new DA rulebook, they should look here. Dims: They are actually Dheneb Stone in the warm areas and light grey in the shadow areas. Bushido Red Panda: It's the cost of doing business. Sometimes they lack the downtime between missions to get everything parade ready again. Mr.Esty: I have to work my way up... next will be a dreadnought. Hudson: Yes again. He has to get fairly "close" to his work and it shows on his armour. Sendraks: Thanks, but I don't know about that. Teese guys are just another spin on the official scheme. There are tons of great variations out there. 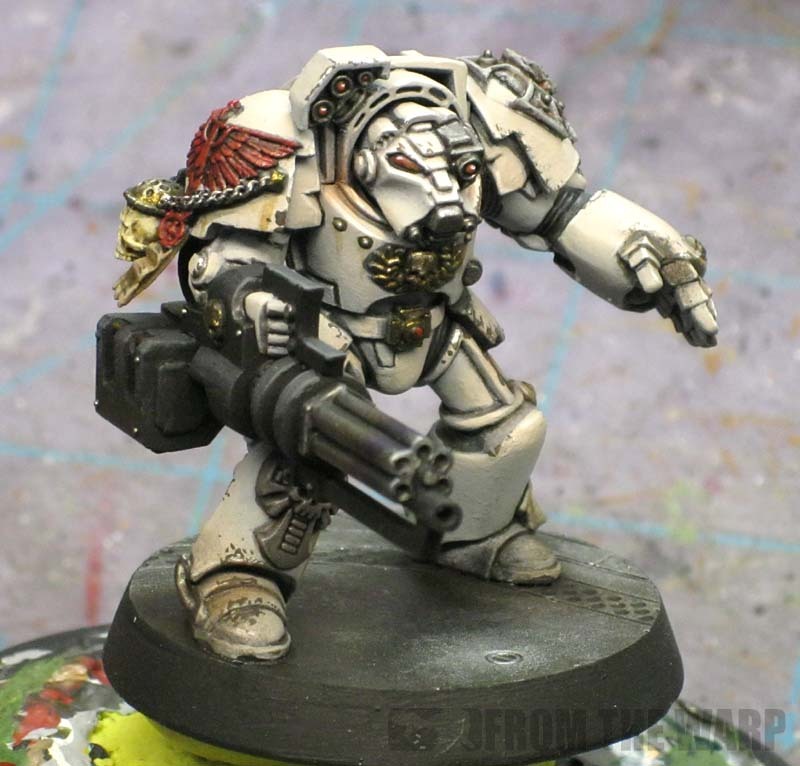 Ron: I agree there are a lot of good Deathwing paint jobs out there and I've stalked enough sites looking for hints, tips and general inspiration. 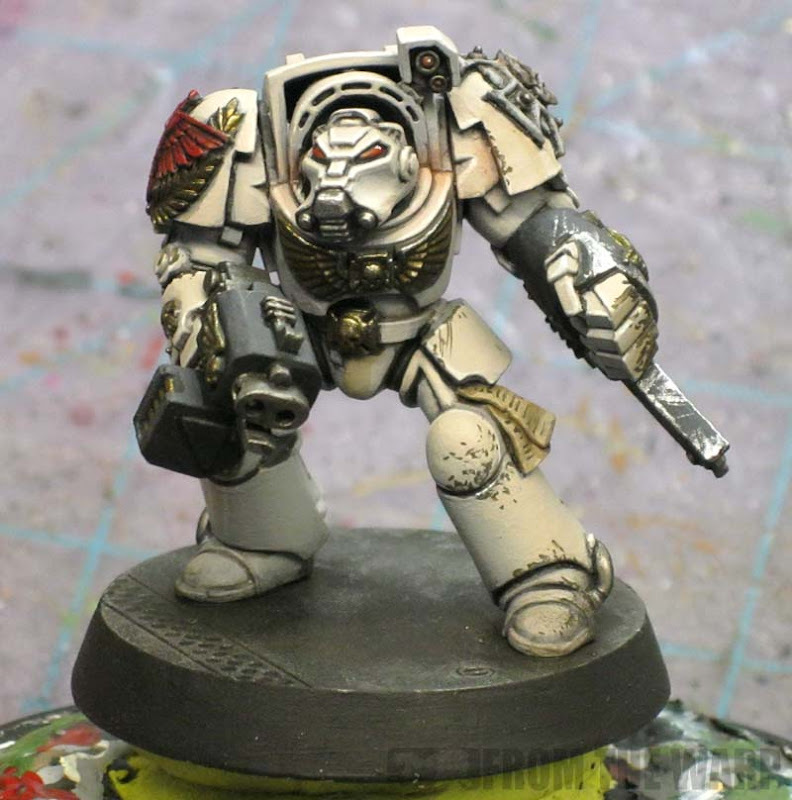 So I've seen a lot of Deathwing paint jobs. Thanks Dave, I had to Google the name, but it made me laugh when I saw who it was. Gorgeous...just gorgeous...so jealous of your skills! Anon: Thanks. It's a good bit of work to get them like this though. Not terribly tough, but really time consuming. The sargeant reminds me of the marine in the Star Craft 2 promo; he just needs the cigar! How'd you do the shaved head/5pm shadow?! Adam: It's thinned down Charadon Granite that you add on in layers until you have the desired "growth."